Edible Finger Paint for kid friendly crafting. Gentle home made finger paint for kids crafts. Let them play without living on the edge. Non-Toxic fingerpaint made from edible, even tasty, ingredients. A smorgasbord of edible paints for the little ones. Not that we want them to eat the paint but, they're kids and sampling the multi color products is part of the deal. Our paints are made with all edible ingredients but that doesn't mean they're tasty. We don't necessarily want the kids to eat the product. But if they do eat it it's good to know that it's harmless. It's important to note that although these paints are safe for the inside and outside of the kids they are not necessarily stain resistant or washable. There are Washable, Non Toxic Fingerpaint products available from Amazon that aren't necessarily edible but they are kid friendly and clothing and furniture friendly too!. Here's how we make our home made finger paint recipe. Adjust the size of the recipe for the amount of paint you want. Mix (in a mug with a fork) 1 Cup white flour (not self rising) with enough water to form a thick smooth paste - about 8 tablespoons or enough to produce a mixture a little thicker than the consistency that you want your finished paint to be), add food coloring, powdered kool aid, powdered jello or any combination to achieve the color you want. Thin to a pudding consistency with additional water if needed. Any crystal drink mix or jello mix can be added to the Flour Power Finger Paint 1 teaspoon to 1/4 cup of paint produces a rich vibrant color, for more subdued colors use less color. To get you started we've listed some color possibilities below but that's just a scratch of the surface. Mix the flavor crystals to create dozens of captivating shades. White - 1/4 Cup of the Basic Flour Power Finger Paint. Yellow - 1/4 Cup Flour Power Finger Paint + 1 - 2 teaspoons Kool Aid, Lemonade powder. Orange - 1/4 Cup Flour Power Finger Paint + 1 - 2 teaspoons Kool Aid, Orange powder. Green - 1/4 Cup Flour Power Finger Paint + 2 teaspoons Jello, Lime gelatin powder. Blue - 1/4 Cup Flour Power Finger Paint + 2 teaspoons Jello, Berry-Blue gelatin powder. Purple - 1/4 Cup Flour Power Finger Paint + 1 - 2 teaspoons Kool Aid, Grape powder. Red - 1/4 Cup Flour Power Finger Paint + 1 - 2 teaspoons Kool Aid, Cherry powder. Maroon - 1/4 Cup Flour Power Finger Paint + 1 teaspoon Tang, Jamaica flavored crystals. Brown - Nutella - Hazelnut chocolate spread available in the peanut butter section. Pour the finished paints into Spill Proof Paint Cups to prevent accidents and keep them from drying out. Cover the kids with an Artist's Smock to keep clothes clean and let them go! In about an hour your child's masterpiece will be dry enough to hang on the fridge or give to Grandma. The budding artist in your life will love the Melissa & Doug Deluxe Standing Easel with Artist's Smock and Spill Proof Paint Cups that make those journeys into creativity so simple. Crayola's Giant Fingerpaint Pad has 25 sheets of heavy duty painting paper. The large 12x16 inch pages can be used as is or cut in half to a framable 8x12 inches. Although these are good sized sheets if you're looking for HUGE, try a roll of 30 inch by 30 foot brown postal paper and have a finger painting extravaganza. 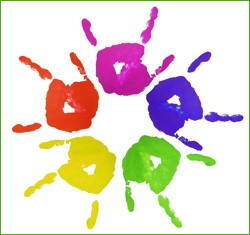 Visitors to our Edible Finger Paint page may also be interested in the following pages.